Gutters are crucial in keeping water away from your house, but to do their job properly, they need to be free of clogging dirt and debris. Fortunately, you have a number of options for cleaning them out—and some don't even require a ladder! 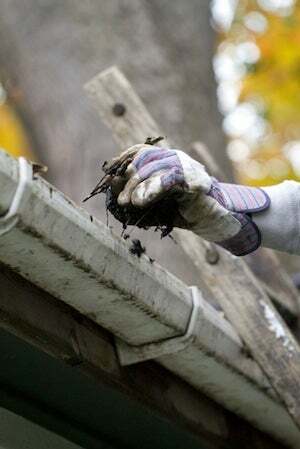 Of all the necessary evils that go into a diligent fall maintenance routine, cleaning the gutters may be the most dreaded of all. Tedious though this task is, homeowners are wise not to neglect it: Properly functioning gutters, after all, help ensure that storm water does not find its way inside. Many leaf blowers come with a nozzle attachment designed to release a narrow stream of air, perfect for the purpose of gutter cleaning. Position your ladder so that you can work gradually toward the downspout, blowing out obstructions as you go. (Be careful to avoid blowing leaves into the downspout.) As a final step, remove any lingering leaves or twigs with a hose. Don’t want to stand on a ladder? A specialized attachment can extend the reach of your leaf blower. To remove heavier debris from your gutters, experiment with a wet/dry vacuum. Your local home improvement retail store likely carries the hoses and curved attachments you need to reach the obstructed gutters from a standing position on the ground. Stubborn, stuck-on dirt may need to be moistened before it succumbs to the vacuum. Again, once you’ve removed the bulk of the material, flush the gutters and downspout with water from a garden hose. Has it been a long while since you last cleaned your gutters? A layer of dirt and debris may have built up over time. Blast it away with the fine-spray nozzle of your power washer. (This type of cleaning can get messy; be prepared to rinse the roof and exterior walls afterward.) For clogged downspouts in particular, there’s no better recourse than a power washer. Simply point the nozzle down the hole and rinse the shaft until water can run freely through it. So long as they are not thoroughly clogged, you can clean your gutters successfully with a garden hose. If the hose is equipped with the right attachment (a rigid tube with a curved end), you can stand on the ground, not on a ladder, as you work. Again, start at the end farthest from the downspout and flush the length of the channel; remove any residual material by hand before it dries out. To clean gutters by hand, you’ll need a ladder, bucket, gutter scoop (or garden trowel), and heavy-duty gloves. Little by little, take out the leaves and debris, placing what you remove into the bucket. Finally, flush the gutters and downspout with water until you are certain both are functioning properly. Tip: If your downspouts are clogged and you don’t have a power washer, try busting through the obstruction with a plumber’s snake, then rinse with a hose. 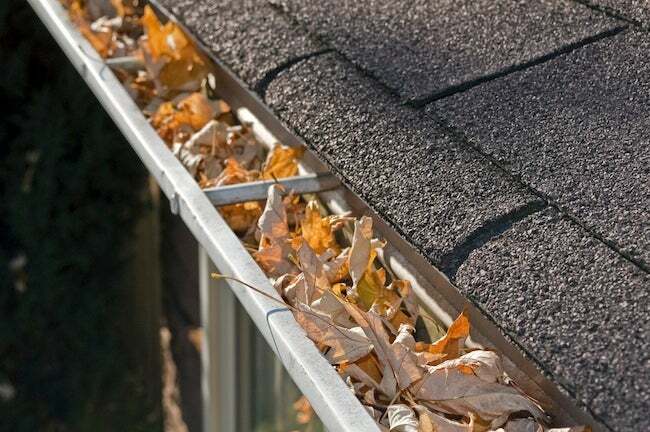 Consider installing a screen or barrier on top of your gutters to prevent leaves and debris from accumulating over the course of the year. Remember what they say about an ounce of prevention!